Coloring Pages for Zane is the answer for parents whose kids want to use crayons and pencils on paper, creating childhood memories of putting art on the refrigerator for all to admire. Coloring Pages is an endless source of printed coloring pages at the tip of your fingers. No need to run to the store when you need a new coloring book. Simply print unlimited pages from your iPhone, iPad or iPod touch. The inspiration for this app was Zane Michels who is the autistic son of Joe Michels, the President and founder of Software Ops. Zane has always loved coloring with real crayons and pencils. We know kids want the same experience of real crayons and paper. 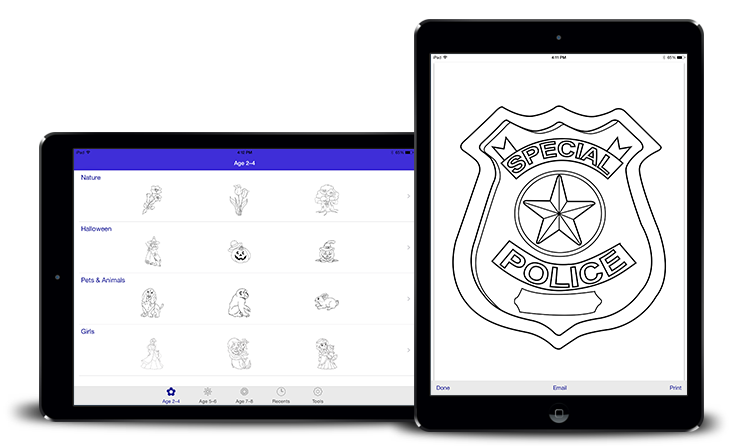 Coloring Pages for Zane is the only app that allows you to print coloring pages over and over to so your kids can color as much as they want. With just a few simple taps, you can select a page to print to an AirPrint ready printer or send to your email for printing. All pages are designed to completely fill a standard piece of paper. No more wasted time running to the store or clicking through poorly designed web sites filled with annoying ads to get the full sized coloring pages your kids want. Featured on Cult of Mac.